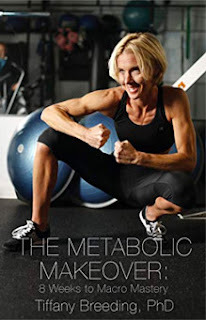 Nashville native, and nutrition expert Tiffany Breeding, PhD, tells the story of her journey to optimal fitness, nutrition and mental toughness in her new book, The Metabolic Makeover: 8 Weeks to Macro Mastery. Breeding was a competitive athlete in high school and never had that “girlish” figure that she wanted; she was always working out and conscious of her weight, but got away with eating what she wanted. As her life and training load changed, as well as the social world of college and real life, she realized for the first time she could not manage her weight just like she once could. Something needed to change. So she went to coaches and nutritionists to get help. Soon after, she and her husband, Stew, moved home to Nashville to open their own performance and nutrition studio. She focused on teaching clients how to maintain a healthy relationship with food by understanding the importance of macronutrients, balance and a positive mindset. In her debut title, Breeding hopes to help her readers find the long term, sustainable path to healthy eating and living. Her book will interest anyone who may feel stuck in their dieting process or just wants to learn the science behind metabolism and how to apply these principles to daily life. Breeding writes about setting effective and specific goals that can be measured and achievable while staying within a realistic time frame. This will help her readers to stay encouraged and positive in their own personal performance journeys. Tiffany Breeding, AKA Dr. Tiff earned her Masters in Kinesiology/Performance Psychology from Georgia Southern (’05) and her PhD in Health and Human Performance from Middle Tennessee State (’08). Breeding is also a Certified Strength and Conditioning Specialist (NSCA) and Fitness Nutrition Specialist (NASM). For the past 7 years, Tiffany has been providing corporate and executive performance to clients through worksite and employee wellness programming. She uses her unique combination of mental and physical performance training to offer clients nutrition counseling, metabolic restoration and performance coaching. For more information, visit Tiffany Breeding at www.workwithdrtiff.com.